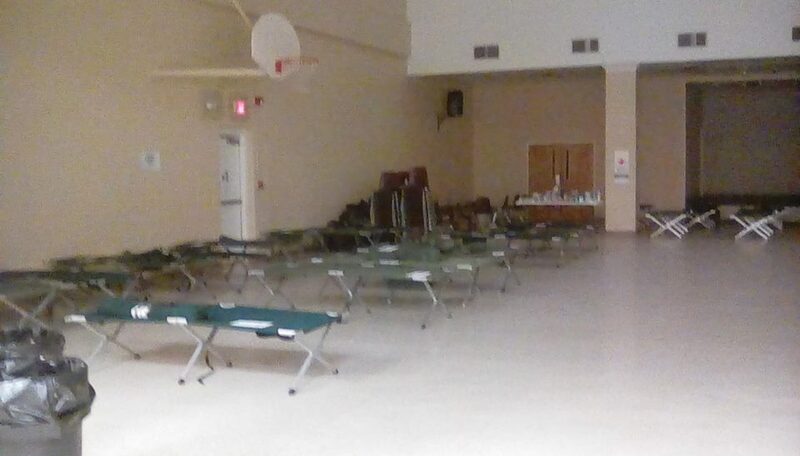 SAVANNAH, Tenn. (BNC) by Jamie Sutter — The Savannah church, home of “Evangelism University,” has opened its doors to victims of flooding from the Tennessee River. Yesterday, I talked with Howard Rogers and Barry Binion, ministers at the congregation. Howard said some more displaced by the flooding, beyond the 15 they now help, come in just for something to eat and go back to a motel, while others stay all night. They are going to have other needs as people go back to their flooded homes and had a group meeting yesterday on how they can serve them in this way as well. 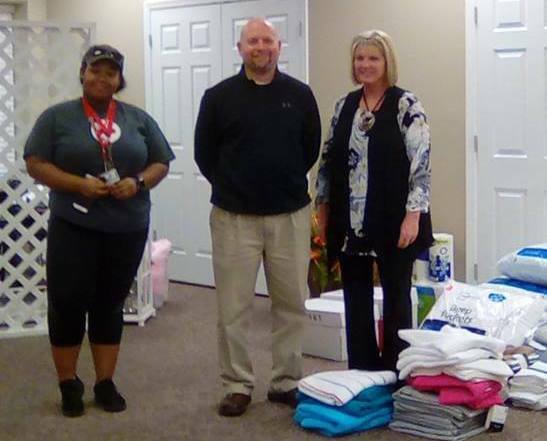 I traveled down to get a look and took some mats, quilts, and food items from our cooperative work, Churches of Christ Homeless Help. This work presently consists of donations from Christian Chapel church in Kenton, Bishop St. church in Union City, and the Madison AL church. The Savannah church already has a work called House of Hope that has clothing and food for the needy in the area, but this will no doubt be depleted with so many displaced. They would appreciate donations and told me to get back with them next week as they would have a better outlook on what damage and other needs would be then. As I left, the parking lot was filling up with people coming in for their evening meal and perhaps a place to stay. The church has wifi that they are allowing guests to use also. Staying connected with family and friends is a comfort along with food and shelter. Check out the church facebook page with other important updates. The young lady above is a Red Cross worker from Gibson County TN, along with Barry Binion, one of Savannah’s ministers, and church secretary Debbie Mabry. They had a meeting yesterday about the needs that will come after the water subsides and are looking at options and making plans. You could not tell when the Tennessee River started when going into Savannah. So many houses underwater! The feature photo was taken from the Catfish Cabin Restaurant Facebook page. The restaurant had a foot of water for the first time in its history, Nor Hagy, of the Acton church in Michie, said. Thanks for this article and thanks to the great brothers and sisters in Savannah, TN for their good work. Savannah is a beautiful city on the Tennessee River and one of my favorite places. It has a great state park with a fine restaurant and because of its location on the Tennessee River, it is one of the most picturesque places in the state. The recent rains have been devastating and our prayers are with those folks and our brethren there.